He Jianku the scientist at the center of the ”CRISPR babies". The Chinese researcher at the center of an international firestorm following reports of the birth of germline edited babies last November, has been fired by his university, the Southern University of Science and Technology (SUSTech) in Shenzhen, China. “Effective immediately, SUSTech will rescind the work contract with Dr. Jiankui He and terminate any of his teaching and research activities at SUSTech,” the university said in a statement on its website. 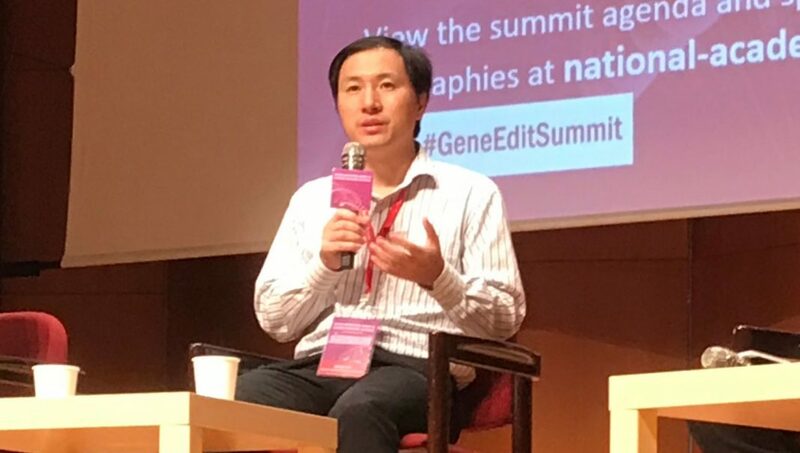 The news follows the release of an official Chinese investigation into the actions of He Jiankui, PhD, the scientist at the center of the ”CRISPR babies” germline editing story. The report was announced by the Xinhua News Agency, the official state news agency of Guangdong Province, which includes Shenzhen. He was an associate professor at SUSTech, one of the top-ranked research universities in China. The official report says that, beginning in June 2016, in pursuit of “personal fame and fortune”, He evaded supervision to conduct reproductive genetic editing experiments prohibited by the state. From March 2017 until last November, He recruited eight volunteer couples in which the male was HIV positive “by forging ethical review books.” Two volunteers became pregnant: one gave birth to Lulu and Nana, as previously reported; another woman is still pregnant. “This behavior seriously violates ethics and scientific research integrity, and seriously violates relevant state regulations, causing adverse effects at home and abroad,” the report stated. In the meantime, Guangdong Province will supervise the health of the twin girls, who have not been publicly identified. He’s actions sparked international outrage two months ago, when reports revealed that he had supervised the birth of twin girls following germline editing. At an international genome editing conference in Hong Kong, He presented details of his work and attempted to justify his decision to target the CCR5 gene to render the newborns resistant to HIV. In late December, Elsie Chen, a reporter for the New York Times, broke the news that He was being held under house arrest with his family at a guest house on the SUSTech campus. Chen photographed He on a balcony while under heavy security. Next articleHe’s Going for Fifth Win on Jeopardy! Correct Response: Who Is U. of Toledo Research Assistant?